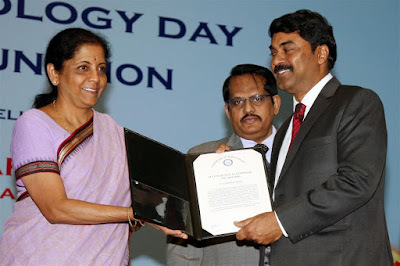 Raksha Mantri Smt Nirmala Sitharaman gave away the DRDO Awards- 2016 & 2017 to various DRDO scientists for their outstanding contributions, while commemorating the National Technology Day, here today. Some of the prominent scientists, who received the award, include former Secretary Department of Defence R&D, Scientific Advisor to Raksha Mantri and Director General, DRDO Dr VKSaraswat for DRDO Lifetime Achievement Award – 2017, former Secretary Department of Defence R&D, Scientific Advisor to Raksha Mantri and Director General, DRDO Dr VasudevKalkunteAatre for DRDO Lifetime Achievement Award – 2016, the Scientific Advisor to Raksha Mantri, Distinguished Scientist & Director General (Missiles & Strategic Systems) Dr G Satheesh Reddy for Technology Leadership Award – 2016, etc. Speaking on the occasion, Smt Sitharaman said India being one of the largest procurer of defence equipment, the emphasis on indigenisation has to be reiterated, which has happened in the last four years. She stated that if India were to be a manufacturing hub for Defence products, indigenization has got to be on the top of the agenda. She said that manufacturing cannot be continuously and constantly with borrowed technology and hence that is where DRDO’s Research & Development plays a very critical role. The Raksha Mantri congratulated all the scientists who received the awards and wished them a great bright future. She also wished the organisation and all its scientists the very best. The Chairman DRDO and Secretary Department of Defence R&D, Dr S Christopher also addressed the function and e-launched the ‘Navrachna’ implementation programme during the event. It was attended by senior officials from the three Services, DRDO and the Ministry of Defence. Army Hospital (R&R), Delhi Cantt organized a programme to celebrate Nurses Day, today to commemorate the International Nurses Day. The Commandant Army Hospital (R&R) Lt Gen UK Sharma addressing as the Chief Guest emphasized that being the most important member of the health team, nurses make a significant contribution in the recovery process of the patients. He also expressed that the profession of nursing is not only challenging but also rewarding. Speaking on the occasion, Additional Director General Military Nursing Services (ADGMNS) Maj Gen Anna KuttyBabu reiterated that nursing has undergone tremendous changes in response to social needs and influences in recent times. She said, right from the time of Florence Nightingale, the nurses have proved their worth to the whole world. Nurses’ Day is an important day as it is an opportunity to reflect on the enormous contribution made by this incredible profession, she stated. Head Quarter Western Air Command, situated in Subroto Park, Delhi conducted a seminar on Humanitarian and Disaster relief(HADR) on 14 may 18. The seminar is being conducted to focus onto effective measures to deal with HADR situations in Northern region of India. Apart from the IAF participation, secretary level delegations from the states of Himanchal Pradesh, Rajasthan, Uttrakhand, Haryana, Punjab and Jammu & Kashmir are participating in the seminar. Major respondents to disaster situations like NDMA, NDRF and ITBP are also attending the seminar. In disaster situations, more often than not, the IAF is the first responder and kick starts the process of help to the affected population. 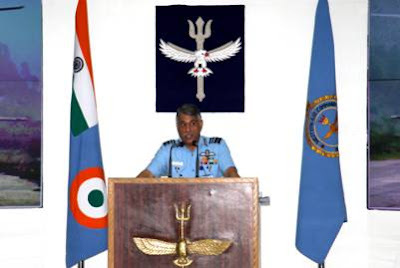 To its credit, the IAF has not only national disaster relief operations like Op Madad – Chennai Cyclone, Op Rahat– UttrakhandFlash Floods, Op MeghRahat– Flood relief in J&K and relief operations at Andhra Pradesh during cyclone HUD HUD, it also has been carrying out relief actions in the international disaster situations like Evac of Indian Diaspora from Yemen, Op Maitri – earthquake relief at Nepal, cyclone relief at FIJI and flood relief in Sri Lanka. In most cases aircraft and personnel of Western Air Command have been the mainstay of these operations. On the agenda are also discussions on National Perspective on Disaster Management & Capability Building and Enhancement of disaster relief for the attending states. Discussions on the response procedure using the IAF platforms would also be held at the seminar. “I hope that by the end of the seminar we would have a clear understanding between all agencies involved in responding to a crisis situation at the earliest in an effective, efficient and economical manner. 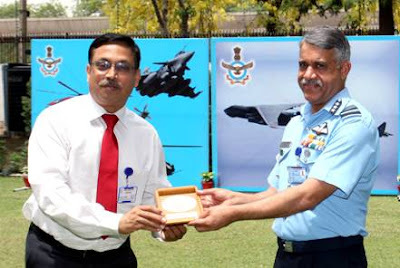 This would definitely reduce the loss of life and infrastructure during calamities” said the Senior Air Staff Officer of Western Air Command, Air Marshal NJS Dhillon AtiVishishtSeva Medal. HQ WAC has been conducting such seminars and demonstrations across its area of responsibility. The present high level seminar held at Subroto park, New Delhi culminates on 15 May 18. 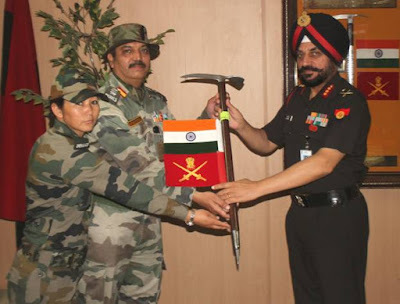 Indian Army Women Officers’ Mountaineering Expedition to Mt. Bhagirathi-II (6512 metres) consisting of nine women officers, was flagged off by Director General of Military Training on 14 May 2018. The expedition will be conducted from 14 May to 11 Jun 18. The team also plans to set a new world record of practicing Yoga at 21000 ft on the occasion of Yoga Day 2018. The expedition aims at encouraging women in the field of adventure where dauntless courage, will-power and determination is put to test. The Indian Army women officers are exploring their maximum potential in the field of adventure sports. Mt. Bhagirathi-II is located in the Garhwal Himalayas in Gangotri National Park. The peak rises right above the Gangotri glacier which sets new challenges for the climbers. The summit is challenging owing to its technical requirements, vertical ascents, inclement and unpredictable weather conditions. It will be a true test of the climbers’ technical acumen in mountaineering, mental strength and physical courage. General Bipin Rawat, Chief of the Army Staff shall be visiting Sri Lanka from 14 to 17 May 2018 on an official visit. It shall be the first visit of General Bipin Rawat to Sri Lanka. During the visit, he is scheduled to meet the senior most political and military hierarchy of Sri Lanka. The visit assumes significance in light of India’s persistent efforts to strengthen the existing bonds of friendship and military cooperation based on mutual interests and understanding. Indian Army has been catering not only for varied training requirements of the Sri Lankan Army including imparting specific tailor-made training in different fields but also providing military hardware support. 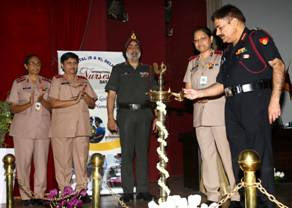 During the visit, the Chief of the Army Staff shall be inaugurating a communication Laboratory at School of Signals, Kandy, conceptualized and established by the Indian Army, to train the personnel of Sri Lanka Army Signal Corps. The Army Chief shall also be visiting the Sri Lanka Military Academy at Diyatalawa to exchange best practices related to pre-commissioning training being followed by the two armies. Apart from interaction with the senior leadership of the three Services, General Bipin Rawat shall also be meeting the Regional Military Commanders at Kandy and Trincomalee. The visit is yet another milestone in reaching out to our immediate neighborhood and take forward the military to military cooperation to the next level. Exercise Harimau Shakti 2018 between Indian and Malaysian Armies concluded with a Closing Ceremony at the tropical rainforests of Hulu Langat on 11 May 2018. The grand finale of the Exercise was a tactical operation on conduct of attack on enemy camp. 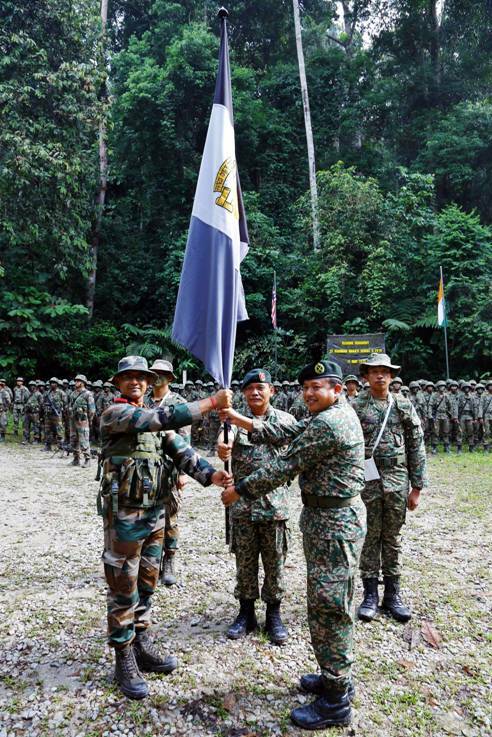 The Closing Ceremony marked the successful conclusion of Exercise Harimau Shakti 2018. The event began with customary salute to Brigadier General Abdul Malik Bin Jiran, Commander 12 Infantry Brigade, followed by national anthem of both the nations. Exercise arm bands were taken off from the exercise appointments and the Regimental flag of GRENADIERS was handed back to Col SN Karthikeyan, CO 4 GRENADIERS by Lt Col Irwan Bin Ibrahim, CO 1 Royal Ranger Regiment symbolising the handing over of the troops back to the Indian Contingent Commander at the end of the Exercise. In his closing address, the Commander complimented the troops from both the contingents for their exemplary conduct, high morale and tactical acumen throughout the Exercise. He also remarked that the Contingents would have learned by sharing their knowledge and experiences. He also complimented the Indian contingent for assimilating and understanding the nuances of jungle operations as per Malaysian doctrine and fighting shoulder to shoulder with their Malaysian Counterparts. The ceremony came to a close with the war cries of both the contingent and customary recital of prayers by the Malaysian Army. 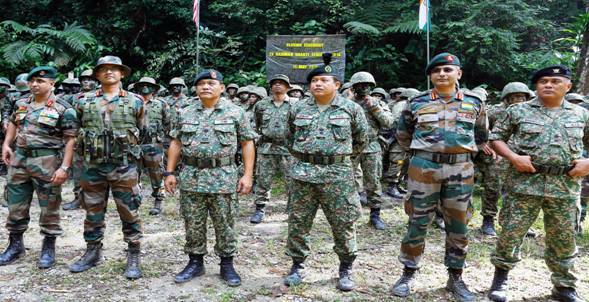 His Excellency Shri Mridul Kumar, Indian High Commissioner to Malaysia, also visited the Exercise contingents at the Exercise area and complimented the troops on successful completion of the joint training exercise. He was highly appreciative of the high spirits and exemplary drills shown by the Contingents under challenging conditions and inclement weather. The professional acumen, operational abilities, battle drills and physical endurance displayed by the contingents over the last fortnight, were of extremely high standard and an apt reflection of the level of interoperability achieved during the Exercise. 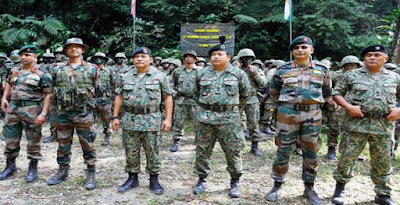 The contingents from Indian and Malaysian Armies have been able to share their experiences in counter insurgency operations and learn from each other. The future editions of Exercise Harimau Shakti will surely take this legacy forward and will ensure that the two nations continue to maintain close defence ties in ensuring peace and security in the region. Gen Bipin Rawat, Chief of Army the Staff today released the book 'Across the Bench - Insight into the Indian Military Judicial System' by Lt Gen Gyan Bhushan, former Army Commander and Member 'A', Armed Forces Tribunal, Lucknow Bench. The book deals with military judicial system vis-a-vis command and management issues within the military establishments besides the whole gamut of issues relating to veterans, their families and dependents. 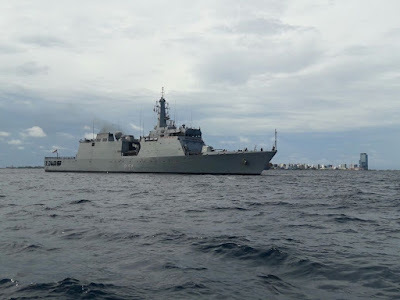 Indian Naval (IN) ship Sumedha, a Naval Offshore Patrol Vessel (NOPV), has been deployed to undertake joint EEZ surveillance of Maldives from 09 to 17 May 18, as part of Indian Navy’s ‘Mission Based Deployments’. The ship would undertake an Operational Turnaround (OTR) at Male from 11 to 12 May 2018, during which the ship would interact and impart training to Maldives’ National Defence Forces (MNDF) personnel. Sumedha would also embark MNDF personnel onboard and undertake joint EEZ surveillance of Maldives from 12 to 15 May 2018. The MNDF personnel would be disembarked at Male, on completion of the EEZ surveillance. The first Biannual Naval Commander’s Conference of 2018 concluded today after four productive days of intense deliberations on a wide range of issues. The Conference was inaugurated by the Raksha Mantri, Smt Nirmala Sitharaman, who set the tone for the deliberations stating that the Indian Navy is a force to reckon with in the Indo-Pacific region. The RM also assured the Naval Commanders that endeavours to bridge critical capability gaps in Ship-borne helicopters, Fleet Support Ships and Submarines would be progressed by the Government. The Minister also extended support to the long-term capability acquisition plans of the Navy that have been formulated with a strategic view of the Indo-Pacific region. The imperative need for approval of the second indigenous aircraft carrier for the Navy was also deliberated upon. This project along with the other shipbuilding projects already underway or in the pipeline including Mine Counter Measure Vessels (MCMVs), Landing Platform Dock (LPD), Anti-Submarine Shallow Water Craft, Diving Support Vessels and Survey Vessels are expected to provide a major thrust to the ‘Make-in-India’ initiative of the Government. The Conference also undertook a review of the Navy’s Mission Based Deployments. The review was aimed at maximising benefits accrued from the deployment of IN ships and aircraft to critical areas within the IOR. Measures such as information sharing with other navies as well as combining Defence Diplomacy initiatives such as Bi-lateral exercises and port visits into these deployments are planned to be undertaken. The Navy’s new Transition Cycle for ships from maintenance to operations was also reviewed by the Commanders. This has resulted in considerable improvement in combat efficiency and crew proficiency of ships undergoing the new Transition Cycle. The new Transition Cycle has also resulted in the overall improvement of Op Logistics, spares management and forecasting, Refit planning and expenditure management. The Naval Commander’s Conference also saw the inauguration of a new Digital Library available pan-Navy for knowledge management and retrieval including archiving of critical data and information. This was complemented by deliberations on the security and hardening of naval data networks in keeping with contemporary cyber security practices. In keeping with the Navy’s ethos of harnessing niche technologies, concrete plans to incorporate Big Data Analytics and Artificial Intelligence into the Navy’s operational functioning have also been formulated. The Naval Commanders also interacted with Shri Arvind Subramanian, the Chief Economic Advisor and the Chiefs of the Army and Air Force. The next edition of the Naval Commander’s Conference is scheduled in Oct/ Nov later this year.